Resident at Great Water Street. 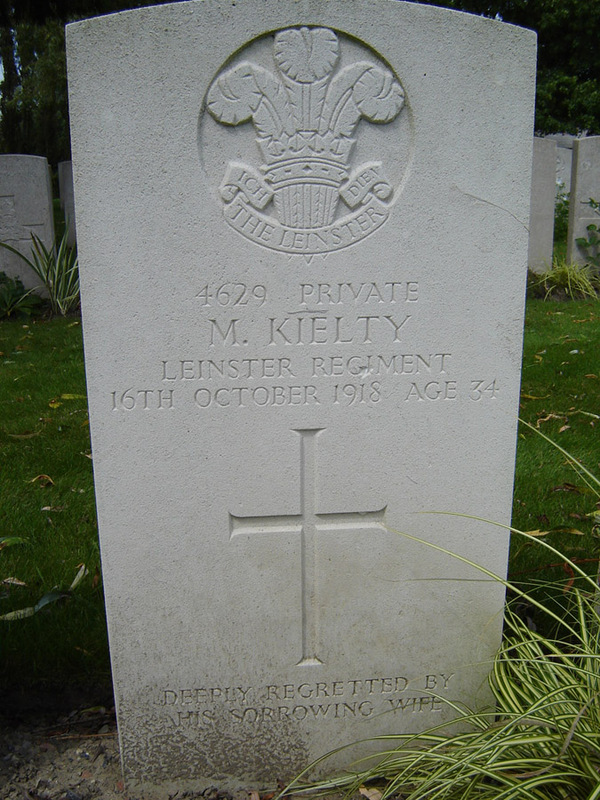 Michael was born Michael Joseph Kielty in Lisduff, Longford on 28 August 1884. He married Bridget Glynn* on the 6 April 1910. Prior to the war, Michael worked as a bricklayer's labourer. Michael enlisted in Longford initially with the 6th Leinsters before transferring to the 2nd Battalion. On the 14 October, the Battle of Courtrai 1918 began, Michael was involved with a major engagement in the Ledeghem in Flanders as part of the advance on the River Lys; he was one of nearly 100 members of the battalion to have been killed, injured or missing on that day. Sadly he died two days later in the 2nd Casualty Clearing Station. Michael's brothers, John and Patrick also served in WW1. Son of Timothy Kielty and Anne (née Coffey) of Great Water Street, Longford. *Bridget resided in Ballymacallen, Moyvore, Co. Westmeath after Michael's death.